Pulitzer Prize winning reporter Jerry Kammer writes: From Chicano Radical to Congressman. 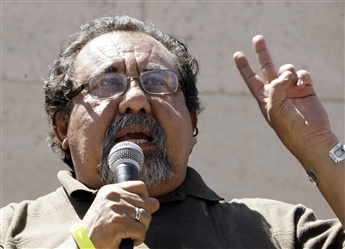 Take the time to acquaint yourself with Arizona’s District 3 Congressman Raul Grijalva. He is the stellar liberal who exhibits greater allegiance to illegal aliens than his state’s own citizens, calling for a “boycott of Arizona goods, services and tourism,” as a response to the new law making it a state crime to be in the country illegally. Using the signature Alinskyite tactics of the community organizer he once was, the law had to be fought at “a political, legal and economic level,” he said. Aside from a boycott, he also wants the federal government to stop cooperating with Arizona, a move he says “would render much of this legislation moot and ineffective,” according to a blistering editorial in Investor’s Business Daily. With Arizona’s unemployment rate currently at 9.4%, the citizens of his southwest Arizona district must be thrilled with the representation they are getting. Watch as Congressman Grijalva, whose district includes 300 miles of the U.S. Mexico border, walks away from a CNS News reporter asking about his commitment to sealing the border and protecting American youth from the influx of illegal drugs. FOX News reports that the Arizona Legislature has sent Gov. Jan Brewer a bill that would ban ethnic studies programs that advocate separatism and racial preferences. It would be tough to argue with that! “Traditionally, the American public school system has brought together students from different backgrounds and taught them to be Americans and to treat each other as individuals, and not on the basis of their ethnic backgrounds,” Horne said. “This is consistent with the fundamental American value that we are all individuals, not exemplars of whatever ethnic groups we were born into. Ethnic studies programs teach the opposite, and are designed to promote ethnic chauvinism,” he said. Horne began fighting in 2007 against the Tucson Unified School District’s (TUSD) program, which he said defied Martin Luther King’s call to judge a person by the content of their character, not the color of their skin. The ethnic studies or Raza program encourages “ethnic chauvinism,” promotes Latinos to rise up and create a new territory out of the southwestern region of the United States while intimidating conservative teachers in the school system. This is the letter Superintendent Horne wrote regarding the termination of the ethnic studies program. National Review Online’s Liam Julian wrote this stunning account: Come Study La Raza: Grievance and Distortion 101. It’s worth your time to familiarize yourself with this deplorable program. We previously wrote Travesty in Tucson, which included links to syndicated columnist Michelle Malkin‘s coverage of the TUSD. Today’s Washington Examiner carries an important commentary by Chief Political Correspondent Byron York. He describes the clarifications made to Arizona’s new unlawful entry law — which bears the title: safe neighborhoods; immigration; law enforcement (Senate Bill 1070). The bill was signed into law by Gov. Jan Brewer on April 23. York’s piece can be read here. And check out the newly incorporated senate amendments here. “I’m not an expert on the [U.S.] Constitution. But I know the Constitution exists for a reason. It exists to protect human beings. To protect the rights of people living in a nation — with or without documents,” announced Shakira Isabel Mebarak Ripoll. And coincidently Radio Campesina Phoenix Vice-Mayor Michael Nowakowski is the Vice President of Communications of Radio Campesina, a network of ten Spanish-language radio stations. The Houston Chronicle must be using the same manual for hyperbolic headlines that the Arizona Republic employs. Try this one on for size: Texas lawmaker to introduce anti-immigration bill. Of course no lawmaker — in either Arizona or Texas — is “anti-immigrant.” The issue is illegal immigration, which doesn’t fit the flagrantly open-borders agenda of the left. Texas lawmaker Rep. Debbie Riddle who represents a solidly Republican district, plans to introduce a measure similar to Arizona‘s new law, in the January legislative session. Ms. Riddle obviously understands the obligations and responsibilities that come with her job. We wish her well. Editor’s note: Since this post was written, the Chronicle changed the headline to the current, less offensive one. And Rep. Riddle is now being joined in the effort by Rep. Leo Berman. The Mark of the Beast: Did Earl de Berge call you? In concluding that Arizona’s senior senator, John McCain is beating the socks off of conservative challenger J.D. Hayworth, Earl de Berge, of the Arizona-based Behavior Research Center claims to have called 800 heads of households, although basing the polling sample on “666 voters” statewide. de Berge has a reputation for being left-of-center. The results can be read here. Meanwhile, Public Policy Polling (PPP) reports quite differently, with a headline titled: McCain’s numbers plummet, regarding his challenge from the right by J.D. Hayworth. Republican primary voters in Arizona expressed dissatisfaction with John McCain as a majority indicate he’s too lenient on immigration and a plurality saying he’s too liberal in general. The poll found that a majority — 45 percent of voters — disapprove of his job performance, while a majority — 43 percent –think he is too liberal. A majority — 53 percent — think he is too lenient on illegal immigration. 55% of voters disapprove of McCain compared to just 34% who give him good marks. When PPP polled Arizonans in September he was at a positive 48/42 approval spread. Since then, he’s dropped 27 points on the margin. Mexico’s condemnation of Arizona’s new unlawful entry law (Senate Bill 1070) is nothing less than disingenuous and hypocritical given the abuses their own — mostly Central American — illegals suffer. The Mexican government which is complaining bitterly about our sanctions has theirs enshrined within their Constitution, trumpeting nationalism and cultural identity, while legally segregating immigrants and naturalized citizens from native-born Mexicans. Read Mexico’s Glass House for the astonishing facts. Syndicated columnist and blogger extraordinaire, Michelle Malkin, exposes the hypocrisy of the Mexican government in her commentary How Mexico treats illegal aliens. Arizona’s law has engendered a firestorm from the left, while leaving truth out in the desert sun to wither and dry. This AP report is typical. Although it details Amnesty International’s exposé regarding the thousands (yearly) of Mexico’s own illegal entrants, who are frequently pulled off trains, kidnapped en masse, held at gang hideouts and forced to call relatives in the U.S. to pay off the kidnappers, and beaten, raped or killed in the process. Arizona’s law mirrors the federal statute, requiring that the question of status can only be raised if the person is legitimately stopped for another offense. Unfortunately, Stevenson’s article will be read by those who accept his misrepresentations as fact. Read the entire law signed by Gov. Brewer on April 23, as Support Our Law Enforcement and Safe Neighborhoods Act. You are currently browsing the Seeing Red AZ blog archives for April, 2010.